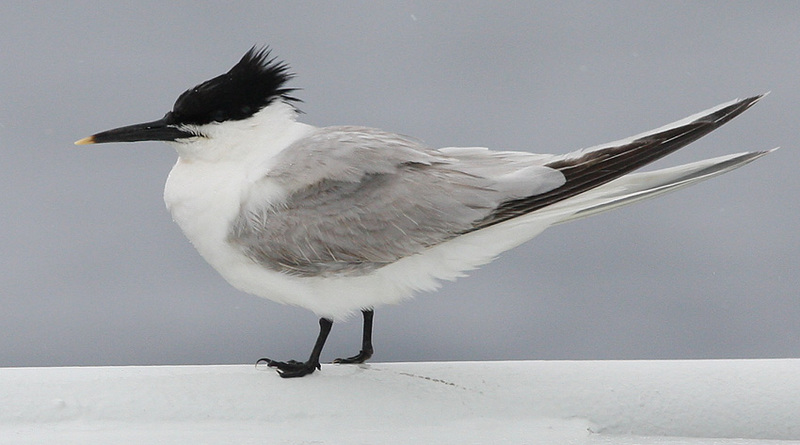 This Sandwich Tern landed on a seismic ship on the Grand Banks on June 27, 2008 – only the third record for Newfoundland. Origins: Breeds in temperate regions along the Atlantic coasts of North America (north to Virginia), Europe and Africa as well as the Pacific coast of North America. Record Details: Six or seven records for Newfoundland: (1) Bellevue, July 19, 1989; (2) St. Vincent’s Beach, November 2, 2005 (following hurricane Wilma); (3) offshore vessel on the Grand Banks, June 27, 2008; (4) one found dead on a fishing boat off the Avalon Peninsula in July 2008 (details scarce); and (5) one at Renews from June 30 – July 2, 2013. Presumably the same bird was observed at St. Vincent’s on July 13-14, 2013. (6) An individual first seen at Renews on July 27, 2016 was likely the same bird found at St. Vincent’s the following two days (July 28-29, 2016). (7) An individual discovered at Bellevue on August 15, 2016 was considered to be different than the one seen at Renews/St. Vincent’s two weeks earlier.